Glide and Get Down to Live DJ's, Disco Lights & A Mirror Ball all on Synthetic Ice! It's the new Friday night place to be! 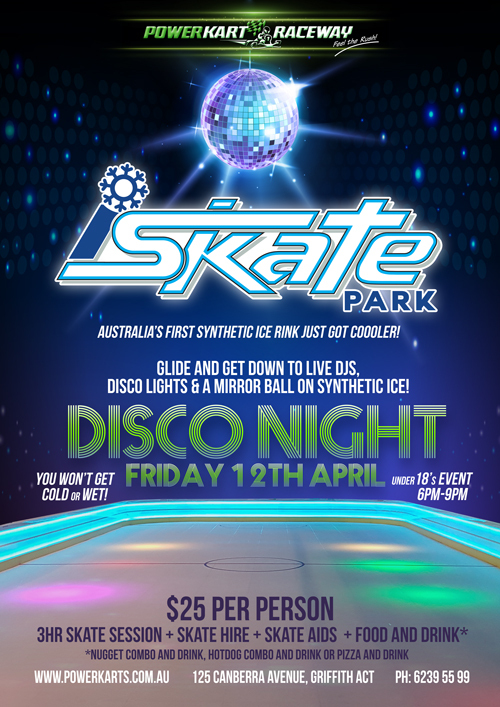 Australia's First Synthetic Ice Rink is now running Disco Nights for under 18's! 6pm-9pm. *Nugget & Chips + Drink, Hotdog & Chips + Drink or Pizza + Drink. The 30x13 meter synthetic ice rink is illuminated by special LED lighting and is suitable for ages 5 years and up. Perfect for groups, families and individuals. Come down to Power Kart Raceway and glide around iSkate Park. Please note: No Refunds will be given for unused skate time. Please read conditions of entry prior to skating. Use of our rink assumes you have read our conditons of entry.